Biology is the science concerned with the study of life Life is a condition that distinguishes living things (animals and plants) from inorganic matter (dead & decaying), in many aspects like growth, reproduction and other functional activities etc. There is no universal definition of life; there are a variety of definitions proposed by different scientists. To define life in unequivocal terms is still a challenge for scientists. Life is a condition that distinguishes organisms from inorganic matter, which is manifested by growth through metabolism, reproduction and the power of adaptation to environment through changes originating internally. According to physicists such as Erwin Scrodinger, life feeds on negative entropy by decreasing the internal entropy of organisms at the expense of free energy taken in from the environment and subsequently rejected in a degraded form. Properties common to a diverse array of living organisms such as plants, animals, fungi, protists, archea and bacteria include a cellular structure with heritable information. 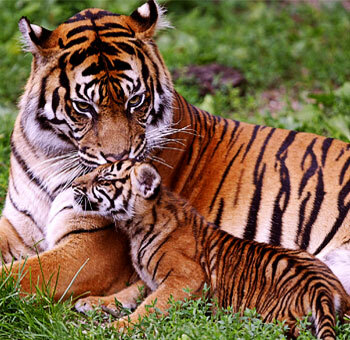 They undergo metabolism, possess a capacity to grow, respond to stimuli, reproduce and through natural selection adapt to their environment in successive generations. So life is defined by scientists as a characteristic of organisms that exhibit the phenomena. 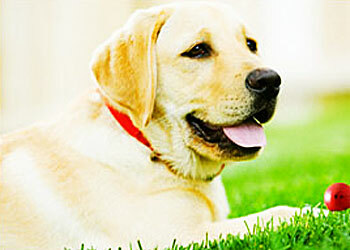 Dogs regulate their body temperature through panting. Have you ever wondered why dog pants on hot days? It's because dog tries to maintain homeostasis. Homeostasis is a word that biologists use to describe how a living organism regulates its internal environment to maintain stability. One very important part of homeostasis is body temperature. Homeostasis is the property of any system especially a living organism, that regulates its internal environment so as to maintain a stable, constant condition. It is the tendency or ability of an organism or a cell to maintain internal equilibrium by adjusting its physiological processes. Body temperature in mammals, for example, is regulated by a sensor that contains the cells within the hypothalamus of the brain, sweating to reduce temperature. Other homeostatic mechanisms include: those controlling blood glucose levels, blood acidity, and hormone secretions. It was also suggested that percentage fat composition and body weight have similar control systems. These homeostatic mechanisms involve the neural and endocrine systems of mammals. Organization: Every organism has a definite biological organization. The external appearance of organism is invariably accompanied by an even more complex internal structure. Plants as well as animals are composed of a number of elements. Atoms in the body of an organism are again united into simple and complex molecules, which are further arranged to form different units like cells, tissues, organs. 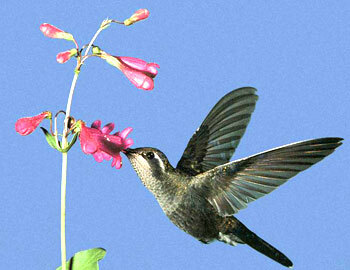 The humming bird obtains fuel in the form of nectar from flowers The humming bird will use the chemical energy stored in its food to power flight and other work. To survive, organisms need to get energy. Energy is captured in many ways, photosynthesis (using sunlight for energy) being one of them. The whole set of chemical reactions that cells use to receive energy is called metabolism. Living things require energy to maintain internal organization (homeostasis) and to produce the other phenomena associated with life. Food provides energy for living beings. The energy is obtained by the breakdown of complex molecules in the cells into simpler ones. The total biochemical reactions involved in the release and utilization of energy within the organism is called metabolism. Metabolism consists of two broad types of chemical reactions that are inter–dependent and continuous. Consumption of energy by converting nonliving material into cellular components (anabolism) resulting in the formation of more protoplasm and therefore growth; and decomposing organic matter (catabolism) resulting in the release of energy. Nutrition, respiration and excretion are all different types of metabolic activities that are carried on by living organisms including their defense mechanisms. 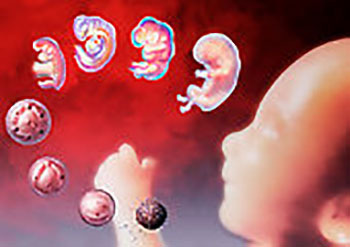 An embryo at various stages of development Growth is defined as a gradual development in maturity, age, size, weight or height. As per the definition, growth is defined as an increase in some quantity over time. This quantity may be in terms of physical quantity i.e., growth in height, or an organism becoming more mature. Growth and development in humans occurs over their lifetime. At every stage of life, there are physical and psychological changes occurring in the human body. In the course of metabolism, when the process of building up exceeds that of breakdown, growth takes place. Growth is nothing but maintenance of a higher rate of synthesis than catalysis. Growth is an irreversible process and a growing organism increases in size in all of its parts, rather than simply accumulating matter. 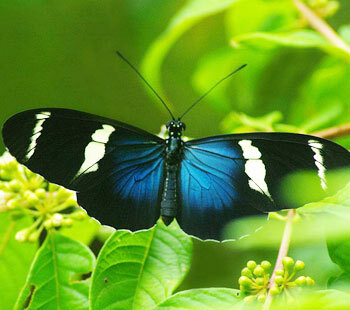 The particular species begins to multiply and expand as the evolution continues to flourish. In case of bacteria, growth is defined as the increase in size and number of an organisms. Even though every living being experiences growth and development uniquely, the patterns are similar for all humans. Inherited information carried by genes controls the pattern of growth and development of organisms. Adaptations contribute to the fitness and survival of individuals Polar bears are much adapted to ice prone environment within the Arctic Circle. Adaptation is the ability to change over a period of time in response to the environment. Adaptations refers to the fitness and survival of individuals. The living organisms face a succession of environmental challenges as they grow and develop in response to the imposed conditions for their survival. Structural, physiological or behavioral changes in an animal or plant which enable it to take advantage of its environment and increase its chances of survival is called adaptation. For example, Tuberculosis bacteria - antibiotics were once effective against TB but now it is growing resistant. This ability is fundamental to the process of evolution and is determined by the organism's heredity as well as the composition of metabolized substances, and external factors present. Permanent adaptation is seen in the development over generations of entire species adapted to live in specific habitats. 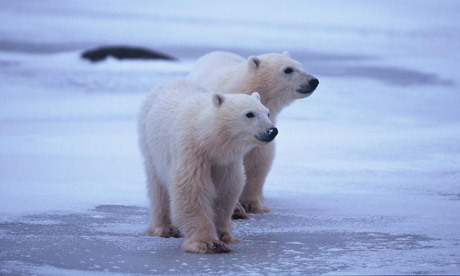 Evolutionary adaptation: The appearance of this polar bear camouflages the animal in its environment. Such adaptations evolve over many generations by the reproductive success of those individuals with heritable traits that are best suited to their environment. 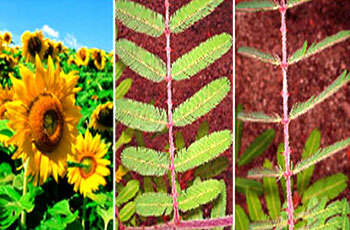 Response to stimuli in Sunflower and Mimosa The leaves of a plant and flower heads turn towards the sun such as in Sunflower. Some plants such as Mimosa leaves close on being touched. These are the examples of physiological actions. In physiology, a stimulus is a detectable change in the internal or external environment and what the organism expresses because of the stimuli is called response. The ability of an organism or organ to respond to external stimuli is called sensitivity. In medical terms, stimulus excites an organism or a part of it to functional activity. It is something that incites to action or exertion or quickens action, feeling, thought, etc., substance or phenomenon that causes or changes activity of an organism. A response can take many forms from the contraction of a unicellular organism when touched to complex reactions involving all the senses of higher animals. Responses are rather easily identified in animals than in plants. Stomata in leaves open up in response to light stimulus. Hunger and thirst are internal stimuli to which animals respond by going in search of food or water. A response is often expressed by motion, for example, the leaves of a plant turning towards the sun such as in Sunflower or an animal chasing its prey. Some plants such as Mimosa leaves close on being touched. 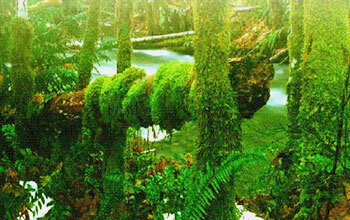 Living things reproduce their own kind Organisms tend to perpetuate their kind through reproduction. Reproduction is the ability to produce new organisms. The resemblance of the offspring to their parents is a characteristic feature of life. Organisms tend to perpetuate their kind through reproduction. Reproduction is the ability to produce new organisms. Reproduction can be the division of one cell to form two new cells and usually the term is applied to the production of a new individual organism. There are several limitations of this definition as many members of several species such as ant workers do not reproduce, but are still considered forms of life. One could say that the property of life is inherited; hence, sterile or hybrid organisms such as mules (a mule is a genetic mix, a hybrid, of horse and a donkey which is similar to resonance hybrid in chemistry) and ligers are alive although they are not capable of self–reproduction. specialized non–reproducing individuals of the species may still partially propagate their DNA or other master pattern through mechanisms such as kin selection. Living things are always connected to environment Living things are systems that tend to respond to changes in their environment, in such a way as to promote their own continuation. Viruses and aberrant prion proteins are often considered replicators rather than forms of life, a distinction warranted because they cannot reproduce without very specialized substrates such as host cells or proteins, respectively. Also, the Rickettia and Chlamydia are examples of bacteria that cannot independently fulfill many vital biochemical processes, and depend on entry, growth, and replication within the cytoplasm of eukaryotic host cells. Life is a characteristic of self–organizing, self–recycling systems consisting of populations of replicators that are capable of mutation, around most of which homeostatic, metabolizing organisms evolve. Type of organization of matter producing various interacting forms of variable complexity, whose main property is to replicate almost perfectly by using matter and energy available in their environment to which they may adapt. In this definition "almost perfectly" relates to mutations happening during replication of organisms that may have adaptive benefits. Life is a potentially self–perpetuating open system of linked organic reactions, catalyzed simultaneously and almost isothermally by complex chemicals (enzymes) that are themselves produced by the open system.